When the water supply canteens ran dry again, Louie began to doubt they'd survive. He thought back to when he first arrived in Hawaii and Eddie Rickenbacker, the World War I ace pilot, and his crew had just been rescued. Rickenbacker and his crew set a new record of twenty-one days drifting on a raft much like the one Louie was in. When the group was picked up, the men were dehydrated, hallucinating and near death. Louie was sure twenty-one days on a life raft represented the outer limits of human survival. As an Olympic runner, a bombardier in the Army Air Corps, and a prisoner of war, Louis Zamperini was determined to thrive and survive. Never backing down from a challenge, Louie lived a life of adventure while modeling hope and forgiveness to a generation. A magnet for trouble as a boy, Louis Zamperini determined to create a new path for himself. Nicknamed the "Torrance Tornado," he set national records and traveled to the 1936 Summer Olympics in Berlin. His resolve as a runner was matched by his will to survive a plane crash, weeks adrift at sea, and years in a prison camp. This American hero encouraged countless others to have faith and to persevere through trials, revealing that no life is beyond redemption (1917-2014). Heroes of History is a unique biography series that brings the shaping of history to life with the remarkable true stories of fascinating men and women who changed the course of history. The stories of Heroes of History are told in an engaging narrative format, where related history, geography, government, and science topics come to life and make a lasting impression. This is a premier biography line for the entire family. Our family was given this book as a gift along with a promotional copy of the book, Gladys Aylward. We were told if we read these two, we'd be hooked. We did both these stories as read-alouds. Both stories captivated our children and ourselves. They are easy reads but very well written and hard to put down when you get started. We are definitely hooked and will be ordering more. Very inspiring and informative stories! I just finished sharing this exceptional book with my family during Christmas break. We were completely blown away by Zamperini's incredible story. We've read numerous books in this series by the Benge's from YWAM Publishing and each story has a special place in our hearts. But Louis Zamperini easily makes my top 10 ten! I see these books are coming out on audio. I might have to try one on my next business trip! Loved this book! This is a great addition to a fabulous series of books. Our family has many favorites - and it is normally the book in the heroes series we are currently reading. I'd never heard of Louis Zamperini but feel blessed to now know of his wonderful story through this book. Highly recommended! Wonderful Story! My husband and I plan to see the movie too. These hero books have blessed my family sooooo much! Thank you! What an incredible story! I LOVE these books by the Benges!! 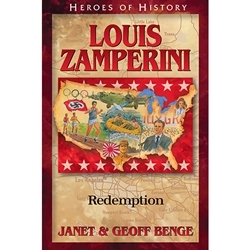 Louis Zamperini is one of my new favorite stories of all the Benge books! I would put this story right up there with Jacob DeShazer, Lillian Trasher, George W. Carver, and one of my very favorites, Gladys Alyward. If you haven't tried these books, just pick one. I've read over 40 of them and I have been deeply moved by EACH story - AND learned so much, right along with my entire family. And the American history stories taught me more about our history than I learned in public school! Thank you Geoff and Janet - keep up the great work! Powerful, compelling story of Louis Zamperini's unbelievable survival adrift at sea / and prison camp interment during WW-II leading to him ultimately becoming a follower of Christ. Another fantastic true story from the Benge's. I can't wait to listen to it on the new audio book that has just released!! I really enjoy the man who narrates the stories in this series. He changes his voice for all the characters and is wonderful to listen to!! In response to reviewer Paul, I’m sorry that you were offended by the word “heck” being used twice in the Zamperini book. I can assure you that we take reader comments very seriously. It is our goal to avoid any offensive language in our books. We will address your objection as the book goes back to press for subsequent printings. —Warren Walsh, Editorial Director YWAM Publishing & Emerald Books. This is the 5th time I am writing this reveiw! YWAM keeps removing it! There is a swear word on page 52, and another on page 137. I highly recommend that you do not purchase this book. I used to be a big fan of YWAM books, and our family has 36 of them. And by the way, YWAM, it is not right when you say "there are no comments for this product click here to be the first to rate this product", when I (and possibly others as well) have written the review 5 times!